Click the image to see more about this book. 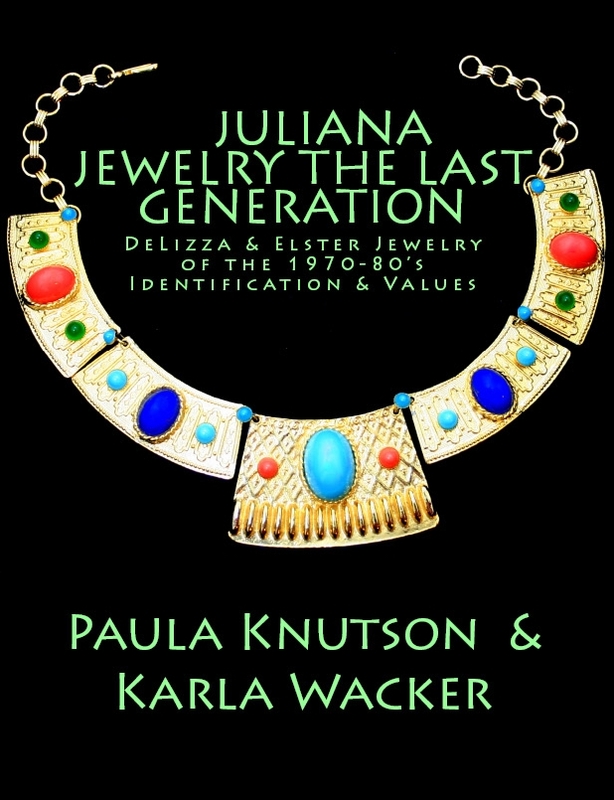 Juliana Jewelry of D&E, The Last Generation, by Paula Knutson & Karla Wacker focuses on the little known jewelry of the last 20 years DeLizza & Elster Inc. This 328 page book presents their high style designs of the 70's & 80's like a magazine fashion spread - on models with fronts & backs. Theme lines for Asian/Oriental, Egyptian Revival, Etruscan, Fox Hunting, Fraternal and Western. Rare slave bracelets, rings, duettes, ear wraps, hair jewelry, and belts beyond imagination. Over 60 pages of front & back figurals. Not to disappoint, some of the most rare and desirable rhinestone sets are included, as well as many never before published pieces. The book will delight and surprise seasoned collectors and provide a thorough variety of examples for those new to the fabulous five decades of DeLizza & Elster, Inc. with over 1500 color pictures. Copyright 2013 JulianaBooks.com. All rights reserved. Design by KDW-Designs.